Sondra and I are on our way to Durant, Oklahoma, to help celebrate the 50th anniversary of the Lone Star chapter of FMCA. I am excited about participating with this chapter as they celebrate this milestone. This will be my first time representing FMCA at a 50-year presentation, and I am really looking forward to it. After leaving our home in Elkhart, Indiana, for Durant, we stopped in Searcy, Arkansas (about half way), to see the A in the A&W team . . . immediate past national president Charlie Adcock and his lovely wife, Gloria. When we arrived, Charlie had just been released from the hospital after having hip replacement surgery. He had to stay in the hospital for a couple of extra days because he fell trying to get to the bathroom. The new hip joint must have come out of the socket; Charlie said the pain was so great he could not move. Fortunately, one of the hip surgeons was at the hospital and was able to get Charlie’s hip back where it was supposed to be within a short period of time. For the next couple of days, Gloria, Sondra, and I had the job of trying to keep Charlie from falling again. I learned quite a lot about hip surgery and the rehab that goes with it. The doctors did not want Charlie to use crutches. He started out with a “walker” and very strict instructions on how to use it. When you are climbing up a step, you place your strong/good leg first. When you are stepping down, you place your “new” leg down first. It also is better to move the new hip fairly often. So, you end up trying to get up and move, then rest, then get up again and move. This goes on all day. The good news is that each day gets better as the hip heals. Sondra and I have a flagpole at our lake cottage. Over the years, we have honored our guests by flying a flag that represents something about them. In Charlie’s case, we fly the United States Air Force flag or the University of Arkansas flag when he and Gloria are staying with us. 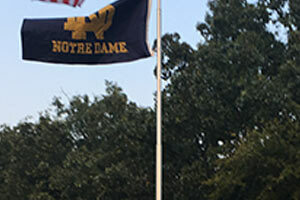 We were really surprised and honored when we pulled up in their driveway this trip and saw the University of Notre Dame flag flying on their flagpole. Charlie knows that I am a big Notre Dame fan. It was a very nice gesture. After leaving Searcy, we made it all the way to Texarkana, Texas. The KOA here recommended that we try out the local barbecue restaurant close to the campground. We walked over for dinner, and it was really, really, good! If you like barbecue and happen to be near Texarkana, be sure to try out Naaman’s Championship BBQ. Do you have a favorite barbecue restaurant? I know someone who uses a motorhome to go all over the country tasting and evaluating barbecue restaurants. I’d love to hear your recommendations! And remember, it’s still all about having fun! I love my hip. It has now been three + years. I have returned to my skis. Tell him to hang in there and to mind the therapists. Great advice. I will certainly pass it on!! Pat and I had several chuckles reading your Hip, Hip Hooray article! Glad Charlie is on the mend. I had two hip replacements and know it is not something I want to do again. I’m sure Charlie agrees! They fractured my femur on the first one and had to redo it. BBQ restaurants, I suggest Smokin’ Joe’s Rib Ranch at Davis OK. It is right off I-35. The best around! What a thoughtful gesture flying the flags that represents your guests. It’s a known fact …. RVers make the best friends!